Interview by Richard Marson on 24th November, 2009 at 11 Beaconsfield Road, Aldeburgh. Ron Ward starts by mentioning he was born at High House on the sea front in 1930, but was immediately taken to the Cottage Hospital in the High Street. Mentions that his father was Bert Ward and ran the coal merchants by the roundabout, which in those days was next to the railway station. Mentions that his mother (whose maiden name was Nicholls) was brought up by her grandparents and lived at the Railway Hotel. Mentions that his grandfather was Charles Ward and he died when Ron was about two years old. Mentions that his grandfather bought and sold property for a living. Mentions he (Ron) was the eldest of six children. Mentions his uncle who ran Ward's Garage and also mentions another man named Ward who ran the local taxi service, but this gentleman was not related. Mentions that after the war his father took over the taxi service. Describes starting school in Aldeburgh when he was four years old and then during the war he was evacuated to Worksop with his brothers and lived with coal miners. Mentions that it was a very traumatic experience. Remembers standing on the platform at Aldeburgh when he was 10 years old with his gas mask and a ticket in his pocket. Remembers that his mother went to Yoxford as the army came to Aldeburgh and took over a large number of houses and remembers the army putting aircraft guns in the gardens. Describes coming back to Aldeburgh after one year and going to Yoxford Primary School. Mentions that when he was fifteen his joined the navy in 1945 and was stationed at HMS Ganges. Describes how all the young sailors had to attend ½ day of schooling each day. Describes his time as an ordinary seaman and travelling the world. Mentions he became a Petty Officer and sailed frigates out of Chatham. Describes how he left after ten years as his wife was ill. Mentions that he was married at 19 years old and his wife was 16 years old at Aldeburgh Church. Mentions that his wife's father was a boot maker and had a little work shop at the bottom of the Town Steps. Mentions that he (Ron) had three children, a little girl who dies and two sons. One now works in Leiston doing odd jobs and the other runs the fishing tackle shop in Saxmundham. Describes buying two cottages for £600 each, next to Mole Hall Antiques in 1960 and knocking them into one. Describes working a Leiston Works when he came out of the navy, and then working for an electrician in Aldeburgh (Noller) and then eventually setting up his own electrical company. Describes becoming a Town Councillor in 1972 when Scott Bottrill was Mayor. Describes how he eventually become a County Councillor and specialised in Development Control. Describes how he then got involved with the Eastern Sea Fisheries at Kings Lynn and is now Deputy Chairman. Mentions that with the help of grants, they have managed to get two large ribs one for Kings Lynn and the other for Lowestoft. Mentions he is also Chairman of the Trustees for Aldeburgh Museum. 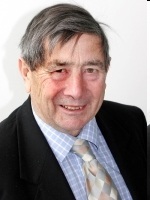 Mentions that he attends as many of the Town Council meetings that he can although he is on five other Parish Councils, mentions Aldeburgh, Leiston, Knodishall and Thorpeness. Mentions that as a County Councillor he is also involved in Rights of Way and footpaths. Describes his duties as a Councillor and the area he covers. Remembers during the war there were a lot of Americans about and also when the Second Front started many troops were billeted in Aldeburgh. Describes a piece of shrapnel in his mother-in-law's coal house roof. Mentions that when he was in the navy there were a lot of men called H.O's. (Hostility Only crews) who did no wear uniform and had been called up because of the war and they were waiting to be de-mobbed.